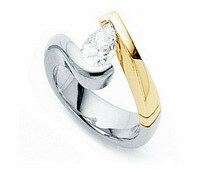 When you decide your love to be your life partner, no other diamond ring is as unique and esteemed as the tension ring. 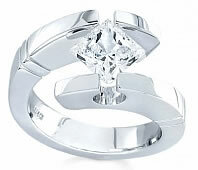 This ring is unique because the diamond is held place by pressure, as opposed to prongs or other traditional mountings. In fact, the average tension ring exerts around 12,000 pounds of pressure per square inch! 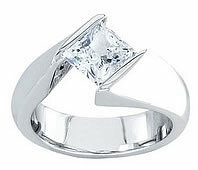 Despite the massive amount of compression present in the ring, it still lends a special look to these perfect engagement rings, as the diamond appearances to be floating in midair. The appearance of the ring may look like the diamond is prone to fall down but a high-quality tension rings can last for hundreds of years before experiencing any loss of the compression that keeps your gemstone firmly in place. Tension rings are constructed based around the required gemstone. If you’re interested in slotting in one of these unique engagement ring into the wedding of your dreams, it’s important to learn how to distinguish the characteristics of the tension ring that will make a perfect ring for your sweetheart. Look for the rings that have been made with special heat treated alloys, as these materials will protect the strength and pressure that is exerted on your gemstone. Additionally, be wary of “tension rings” which feature a strip of metal running across the bottom of the gemstone. These are not true tension rings, since the gemstone is held in place by a combination of pressure and the strip of metal. If you’re looking for beautiful tension rings that will make a perfect engagement ring or unique wedding ring for your sweetie, browse through novori tension rings’ extensive selection of brilliant high-quality tension rings!